Margaret Easton is 22 years old and has no marriage prospects even hinted at. Her parents are determined to see her married and if Society of Britain won't take notice of her she is to be wed to a gentleman of Europen descent. But Margaret loves her life in England and is determined to marry a gentleman who calls England home. Only one man has captured her attention and she knows not his name or social status but they have exchanged 10 second moments since they first saw one another. 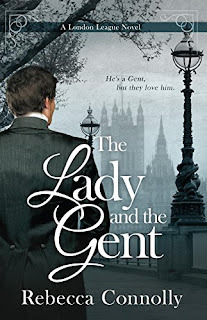 Rafe Thornton has never before noticed a lady but Margaret Easton has done just that. But he has secrets to keep and a duty to the Crown which Margaret has managed to distract him from. But when Margaret finds herself in need of a hero he happens to be there for her. But he needs to keep his true identity hidden so as to not compromise his work. To Margaret and those with whom he works, he is simply known as the Gent. And the Gent has a reputation one that as Margaret come to know him suits what she has seen in their 10 seconds. But Margaret finds herself at the mercy of a chaperone who has motives that seem bent on destroying and her hopes for the future. What Margaret needs is a champion who will save her before time runs out. But can she trust her fate to a man whom she has barely spent any time with? Or will she have to hope that her parents will return before her ruination is complete? If you love your Regency Era reading to be trimmed with treachery, intrigue, and romance you will enjoy this first book in the London League series. But a word of warning - don't read it if you have the habit of saying, "Just one more chapter," else you will be reading the night away as one more chapter is just not enough. I know because I ended the book on just such a promise that saw me seeing 5 am which is not good when morning comes before 7 am. Wait for the weekend and not a workday. Margaret Easton needs a husband, and she needs one now. Her parents are convinced that only a European will do, but Margaret wants nothing more than to stay in England. The trouble is that there is only one man Margaret can think of, or rather, one she cannot forget, and he wouldn’t do as a husband at all. Then she finds herself in his care unexpectedly, and her hunt becomes even more complicated than she could have ever imagined. Rafe Thornton has never said more than ten words to Margaret Easton, but she is rapidly becoming the sole occupant of his thoughts. She is distracting him from his operative work as the Gent, and keeps him from his usual focused nature, which he doesn’t mind at all. When she stumbles into his world, his work and his emotions collide, forcing him to choose between saving the Crown, and protecting his love.